Warning: these pages are content-rich (a lot of text, and some graphics-size is currently 70kb). Average size is 30k-50k but some are as large as 200k, so they may take a while to load. Please be patient! What's new on this web page? If you see the date changing on this page, without an announcement in this section, it is probably something like fixing minor coding problems, spelling errors, minor layout changes, new page on this site (so I changed bottom index), ... Any major changes to this page, will be announced here. February 20, 2015. Sam Andrew died after complications heart attack. March 13, 2012. Is the scheduled release date for Big Brother and the Holding Company Featuring Janis Joplin "Live at the Carousel Ballroom June 23, 1968". This was recorded by soundman Owsley "Bear" Stanley. September 24, 2009. James Gurley died of a heart attack at his home in Palm Desert, CA. He was 69 years old. July 7, 2008. I just picked up the 2 CD set Big Brother and the Holding Company - The Lost Tapes. In Europe, this is called Ball & Chain and Charley Records states CD 1 was recorded January 1967 at the Matrix. CD 1 was a previously unreleased live recording, with absolutely NO liner notes or details of any kind. CD 2 is the July 28, 1966 California Hall, San Francisco, CA which has been released multiple times under multiple titles many times in the past. May 31, 2007. You can now listen to streaming free music from this band as well as others at Wolfgangs Vault. July 18, 2005. I just noticed that the ezBoard message board that I had set up for this web site had been deleted. Since restoration of the deleted conference is only available to subscribers to their service, and since the activity was relatively light, I not planning on looking for another message board. If you do think a message board is worth while, or you have a message board that you like, let me know and I may promote it here. As always you can contact me here. December 26, 2004. I just picked up my DVD copy of Nine Hundred Nights. A documentary on Big Brother and the Holding Company. I cover the details of this documentary in the Video Media/Filmography of this web page. June 7, 2002. The revised WebRing code should be functional on the new server (Yahoo! had dropped the Web Rings). March 11, 2001. Today, I applied to join the Janis Joplin WebRing. Jump to Other Big Brother and the Holding Company Links, to check out the other sites who are part of this WebRing. March 10, 2001. It looks like I may have been premature in moving to a new web hosting site. I just found out that whenever Tripod.com is having hardware or software problems with their servers, they put up a message for the webmaster that their site is in violation of terms, and the web site has been deleted (instead of a message about system problems and try again later). Anyway, I believed Tripod.com when they said they deleted my account, so I will be moving, and making chromeoxide.com my new home on the web. March 6, 2001. Sometime between March 1 to March 5, 2001 Tripod deleted my account/web site. The last stats Tripod gave me were 9,000+ visitors per month. Since my site is so popular, I have decided to keep it going, in spite of this major setback. But rather than trying to build up another free web site, and possibly deal with this problem again, I decided go with CommandLine.net to host the new chromeoxide.com. October 31, 2000. The new Chrome Oxide Music Collectors Pages Message Board is provided by EZBoard. October 31, 1999. There used to be a complete listing of all the bands featured on this site at the bottom of each page on this site. The complete band list has now been moved to the Site Map. Back in June 1997 when I started this site, the index at the bottom of the page seemed like a good idea. Due to the amazing growth of this site, I now think that the Site Map is a better way to do it. I will continue to list the featured band of the month at the bottom of each page on this site. December 3, 2002 CD Now is undergoing changes, and asked that ALL links be removed. October 28, 1999 I signed up with CD Now. October 22, 1999. The Chrome Oxide Music Collector Pages web site hit the big time! And I didn't even know it. Tripod stats showed that this web site had more than 4,000 unique visitors last month (September 1999). Because of that, Tripod has increased my web space from 11mb to 50mb. September 2, 1999. I just bought the Janis Joplin "Collection - Box Of Pearls" box set. This is a each of the 4 original albums Janis was on, as well as a bonus EP only available with this box. Each of the albums has at least 3 bonus tracks never before released. If you don't already have it on CD, this is the box to get. Otherwise, all the albums are available individually with the bonus tracks (except the bonus EP). May 21, 1999. On the advice of legal counsel, we have now added a copyright notice, and legal disclaimer to the bottom of each page on this web site. March 31, 1999. I started a new section on this page, Classifieds. Now, if someone is interesed in putting an ad here, or I find something I think is worthwhile, there is a place for it. March 16, 1999. Thanks to a recent visitor to this page, we now have a logo for the Chrome Oxide Music Collectors Pages, as well as a new background and seperator bars. There may be additional changes to look forward to as well. September 10, 1998. I combined the Mirror Sites and the counter section into one place. Big Brother and the Holding Company was a rock/blues band out of San Francisco, CA in the mid to late 1960s. 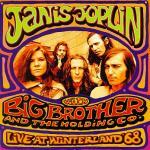 Big Brother could rock out with the best of them, and Janis's blues vocals took your breath away. Because women vocalists in rock bands in the 60s were unique the bands contribution to their music was ignored. This lead to an early breakup. I don't think either performer recaptured the magic they had as a group. I think that feeling is echoed by the record label, which recently released a live performance by Big Brother and the Holding Company with Janis Joplin from April 1968, at Winterland. 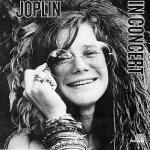 Janis Joplin died October 4, 1970. Comments and corrections would be appreciated. And of course, any audio-video-print additions to my collection would be appreciated. I am also interested in getting wider exposure for this site. So links from your site to mine would be appreciated. And if you know of any sites that allow/encourage submission, I would also appreciate knowing about them as well. Do you have any articles, books, albums, tapes, CDs, ... on this band that you would like reviewed and / or integrated into this page? Do you have any other band that you would like to see a page for on this site? Big Brother didn't start out with Janis Joplin. They went through the normal personnel changes that any starting band faces. CD release called "Cheaper Thrills"
(vinyl release had 1 more song, and songs were in different order). Vinyl release called simply "Big Brother and the Holding Company"
CD release called "The Monterey International Pop Festival"
It was a 4 CD set, and includes many other bands as well. CD release called "Live Thrills"
LIVE SHOW: April 11, 1968 Appearance on ABC-TV "Hollywood Palace"
CD release called "Cheap Thrills"
CD re-release has 4 bonus tracks, 2 studio, and 2 live. Hot Wacks Book XV - The Last by ????. Published by The Hot Wacks Press. Copyright 1992. 802 pages. Published by Omnibus Press. Copyright 1983. 60 pages. Published by Omnibus Press. Copyright 1996. 950 pages. Hardbook (oversize). Published by Delilah Books. Copyright 1982. 275 pages. Paperback. 483 films. 75 photos. Live show listings come from various sources, including the below listed books, visitors to this web site and from other web sites. None of these listings have been verified by me. And just because there was a print advertisement for the show, is no guarantee that there weren't problems which caused the show to be cancelled. Published by Artabras. Copyright 1987. 516 pages. Hardback. Published by Acid Test Productions. Copyright 1997. 240 pages. (p3) 35th Anniversary Whisky-A-Go-Go 1999 Poster Calendar, has reproductions of many of the posters used over the years as well as listings for . Published By Shirmer Books. Copyright 1995. ??? pages (not numbered). Hardback. Studio sessions released as multiple 45s, and a single LP. LIVE SHOW: June 17-18, 1967 Monterey Pop Festival, Monterey, CA Big Brother and the Holding Company's complete set is on this release, along with many other bands partial and complete sets. A combination of studio tracks, and live tracks. 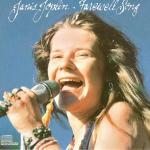 This was listed as a Janis Joplin release, but out of 9 tracks, 6 tracks were with Big Brother. This is the 3CD box set. It is a combination of studio tracks, and live tracks. This was listed as a Janis Joplin release. Out of 49 tracks, 22 tracks were with Big Brother. Live tracks with Big Brother, and with Full Tilt Boogie Band. This was listed as a Janis Joplin release. Out of 14 tracks, 8 tracks were with Big Brother. (a0) 5CDs = Janis Joplin "Collection - Box Of Pearls"
This is a re-release of the 4 original albums, with bonus tracks, and a bonus EP CD. This has the to Big Brother albums, Kozmic Blues Band, Full Tilt Boogie Band, and a bonus CD with previously unreleased tracks from all versions of the band. While not formally released, this was available as a C-90 cassette. 30 minutes. Black and White. 6 complete songs and interviews with the band. Live, in studio recording at KQED TV April 25, 1967, San Francisco, for the show Come Up The Years. Monterey Pop, a documentary of the 1967 Monterey Pop Festival that features Big Brother and The Holding Company performing two tracks. Janis, a 1975 documentary on Janis Joplin, that contains footage of Janis including interviews, and performing with various bands, including Big Brother and The Holding Company (at Monterey Pop festival & other places). Keep On Rockin', a 1972 documentary on the Toronto Pop festival, that for some reason has footage from the 1967 Monterey Pop festival. Petulia, a 1968 movie that had some brief on screen appearances by Big Brother and The Holding Company. Nine Hundred Nights (DVD) a 60 minute documentary on the band that was done in 2001. There is some black and white footage, and some color footage. New interviews were conducted with the surviving members members. New interviews were also conducted with Nick Gravenites (later member of band), Lenny Kay (musician and historian) and Ellen Willis (writer). There are also older interviews with all band members (mostly from the April 25, 1967 KQED performance). There are fragments of multiple live performances, mostly from the April 25, 1967 KQED performance. In addition, there are also some live performances from the June 1967 Monterey Pop Festival, as well as one early studio rehearsal, Columbia Studios recording session and a couple of clips from Generation Club. Part of the bonus material include complete video clips of 4 songs, 2 from April 25, 1967 KQED, 1 from June 1967 Monterey Pop Festival and 1 from Generation Club. Bonus material includes a timeline of the band, a discography, a photo gallery, a poster gallery, 4 complete video clips, 1 complete audio clip, interview outtakes. Do you have a Big Brother and the Holding Company related site? Do you want a link from this page? E-Mail me! Official Janis or Official Janis, Official Janis Joplin web site (by the family and estate of Janis Joplin). Big Brother and the Holding Company 1965-2005 or Big Brother and the Holding Company 1965-2005 a book about the band. Now available as a PDF download. This is an experiment. I am listing various classified ads that might be of interest to browsers of this page. Let me know what you think of this idea? And if you do order something listed here, let them know you found out about it here. Also, let me know how this worked out for you. 3. Janis - The Source - NBC Radio Special. Does this exist? 4. Janis - Rhythm & Takes & The Heart Came Back Is there a good live show with both of these songs?? MusicStack looks like a good source of used music items (LPs, CDs, posters, ...). Back in October 1999 I put up links to CD-Now so that visitors could easily link to the related band pages and instantly see which items were still in print/available for purchase. CD-Now no longer has that option. For the moment I am putting in Amazon.com search boxes. Amazon.com doesn't easily allow for links to individual band pages in the same way that CD-Now used to. So, instead of me being able to create direct links, I have put up the Amazon.com search box instead. So you can still go to a page with the various bands products, buy you now need to go through a search box. Would you like to show your appreciation for (the time, effort, money, ... that goes into creating, maintaing, updating) this web site, without getting anything in return (except a listing of your name (and url) on this web site as a friend of this web site)? COPYRIGHT NOTICE Materials may be freely copied and distributed subject to the inclusion of the copyright notice and our Web site address. LEGAL DISCLAIMER This site contains links to other Internet sites. These links are not endorsements of any products or services in such sites, and no information in such site has been endorsed or approved by this site.